All shook up over shale gas? The manner in which unconventional gas, and in particular shale gas, has changed the widely accepted outlook for natural gas since the middle of the last decade is remarkable. However, two recent independent reports from the US and UK have linked the hydraulic fracturing, or “fracking” process with increases in seismic activity. Headlines of manmade earthquakes and ground water pollution are likely to shake the public perception and cause European governments to hesitate before progressing with aggressive development of national shale gas reserves. The manner in which unconventional gas, and in particular shale gas, has changed the widely accepted outlook for natural gas since the middle of the last decade is remarkable. Whilst there has been vocal environmental opposition, the speed at which shale gas has been brought to market in the US to alleviate import dependence, has changed the perception of natural gas to one of plentiful reserves at relatively low cost. However, two recent independent reports from the US and UK have linked the hydraulic fracturing, or “fracking” process with increases in seismic activity. Whilst the science and understanding behind any actual causal link and the associated risks will undoubtedly become clearer over time, headlines of manmade earthquakes and ground water pollution are likely to shake the public perception and cause European governments to hesitate before progressing with aggressive development of national shale gas reserves. Shale gas is a form of unconventional gas and refers to natural gas trapped in shale, a fine grained sedimentary rock. Unlike conventional gas exploration which typically has a low success probability but high yields, shale gas can be found with relative certainty but with generally much lower returns. The most common extraction method is by a process of hydraulic fracturing, or “fracking”. 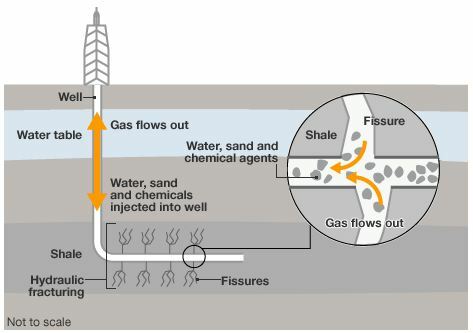 Under this process, a mixture of pressurised water, sand and chemicals is forced into the well causing the rock to fracture or creating fissures that allow the gas to escape. Chart 1. Hydraulic fracturing or “fracking” process. Phrases such as “paradigm shift” and “game changer” have perhaps been a little over used in describing the US shale gas revolution. However there is no question that shale gas has structurally changed global gas fundamentals. There was no mention of shale gas potential when global gas reserves were analysed in the IEA 2006 World Energy Outlook. Yet barely 5 years later shale gas has allowed the US to return to self sufficiency with a realistic prospect of becoming a net exporter in the foreseeable future. There is little doubt that the perception of natural gas as a primary energy source has changed to one of abundance at a relatively low development cost. 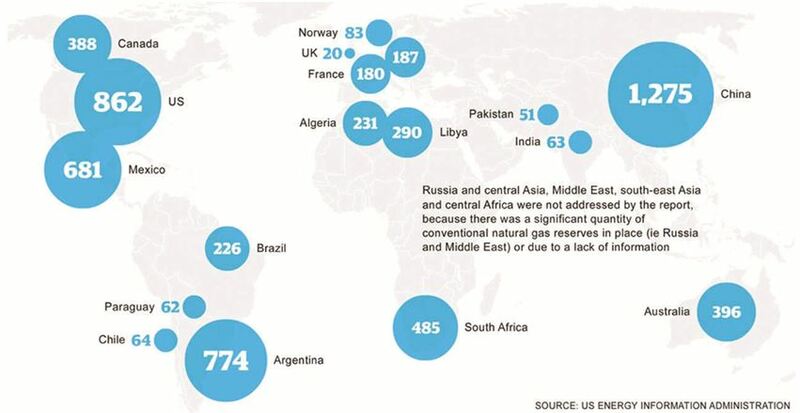 Earlier this year the IEA estimated that there were over 800 tcm of remaining global recoverable reserves, a quarter of which was shale gas, which equates to 250 years of consumption based on current production levels. In Europe, the speed at which countries have taken to shale gas has been varied. Poland, and to a lesser extent Germany, have aggressively investigated the potential whereas France imposed a moratorium in 2010 on shale gas wells in response to environmental concerns (discussed below). In the UK, Cuadrilla Resources announced in September this year that it had discovered shale gas reserves of over 200 tcf (although there are question marks about how much will actually prove to be recoverable). Gradually, over time, hopes have been raised that Europe can repeat the US shale gas revolution, providing an opportunity to reduce dependence on Russian pipeline and LNG imports. At a broader level, scientists have begun to question the eco-credentials of shale gas. The chart below compares the greenhouse gas footprint across a range of energy sources. 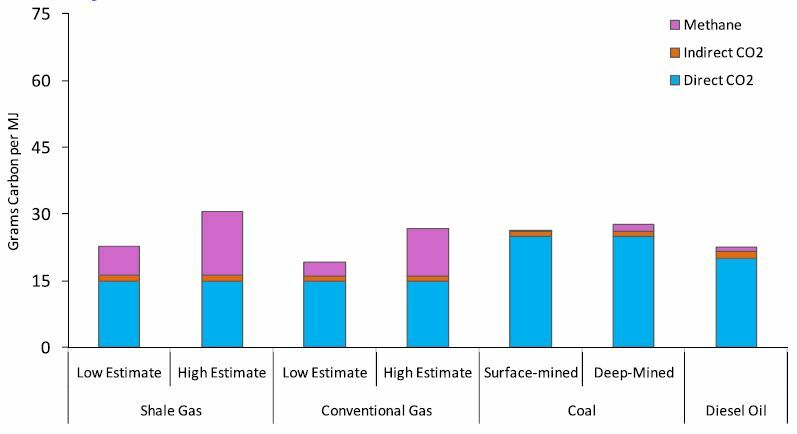 Source: Methane and the greenhouse-gas footprint of natural gas from shale formations (Robert W. Howarth et al). It has been argued that shale gas has a 20% higher carbon footprint than coal or oil due to the release of methane, a far more potent greenhouse gas than cardon dioxide, during the fracking process. The effect is even more pronounced when looked at over a shorter time horizon as methane has a far shorter life as a green house gas than carbon dioxide. Recent reports linking shale gas exploration with increased levels of seismic activity are likely to have a far more damaging impact on public confidence in shale gas as the answer to Europe’s energy requirements. In the US the practice of subterranean fluid injection, primarily for waste disposal, has long been linked with manmade earthquakes. The US Geological Society has explicitly acknowledged the prospect and refers to a case in Colorado in the 1960s when, after a magnitude 5.5 and a series of minor tremors, fluid injection was halted after the link had been established. But recently there has been a specific focus on whether the fluid injection associated with hydraulic fracturing can have the same effect. For example, in a recent article it was highlighted that Oklahoma had around 50 quakes per year up until 2 years ago but experienced well over 1000 in 2010 most of which were centred around an area with over 180 injection wells. Whilst it is important to acknowledge that apparently strong relationships do not imply causality, such facts have been latched onto by critics of shale gas, and the associated negative publicity will undoubtedly challenge public perception around safety. In the UK, exploratory shale gas drilling was suspended following two small Earthquakes centred near Blackpool in Lancashire. An independent report commissioned by the owner of the wells, Cuadrilla Resources, confirmed the link between drilling and the quakes. These conclusions were later backed up by the British Geological Society. Two tremors measured 1.5 and 2.3 on the Richter scale, barely perceptible and similar in magnitude to the dozens of quakes that occur naturally in the UK annually. However, this is likely to be of little comfort to the public in a region that has little experience of earthquakes and inadequate infrastructure to deal with significant seismic activity. However, even if the direct causal link between the fracking process and earthquakes is confirmed it is worth taking a step back to consider that pursuit of energy resources has a track record of triggering earthquakes on a somewhat grander scale. In 2008, almost 80,000 people were killed in China’s Sichuan province when a devastating 7.9 magnitude quake was triggered by a new dam that allowed 320 million tonnes of water to press down on a fault line. Underground coal mining has also long been linked with increased seismic activity. Australia’s most devastating earthquake near Newcastle in 1989, which killed 13 people and caused over $3.5 billion in damage, was linked to over 200 years of mining activity. In 2006 in Basel, Switzerland, a 3.4 magnitude quake was linked to a local geothermal plant forcing it to be closed. Concerns over the environmental impact of the fracking process and associated seismic activity add to the uncertainty around the potential impact of shale gas on the European energy landscape. Uncertainty is particularly focused on the role of gas as a primary energy source and the role gas fired generation will play in the power sector. Environmental concerns will undoubtedly influence how aggressively countries pursue shale gas exploration in the short term (for example, drilling has been suspended in the UK). This uncertainty could not come at a worse time for the European energy markets. Europe stands on the verge of re-entering recession, testing government commitments to aggressive decarbonisation policies. In parallel, the massive investment required in energy infrastructure over the next decade is threatened by access to financing and capital constraints. An increased focus on research to understand the causal link to seismic activity and the wider environmental impact of shale gas extraction is underway. A greater understanding of the causal links and risks associated with shale gas production will undoubtedly reduce public concern. Over the longer term, production technologies are likely to evolve to address environmental concerns. For example, new technologies may be able to significantly reduce the methane emissions associated with shale gas production and a Canadian firm has recently come up with a water purification process that claims to be able to return fracking waste water to a drinkable standard. History suggests that the prospect of relatively cheap and secure energy resources will prove too much to resist for countries with significant reserves and shale gas will likely become a core source of primary energy.